A parliamentary report in 1777 recorded parish workhouses in operation at Alton (for up to 60 inmates), Bentley and Odiham (40), and Faringdon (8). 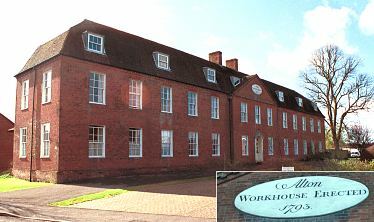 In 1793, Alton erected a new workhouse on Anstey Road. Binsted (or Binstead) operated a parish workhouse in a building on The Street now known as Cobdens. 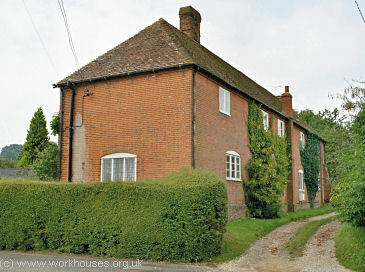 Binsted former parish workhouse, 2004. The Froyle parish workhouse, located at Lower Froyle, opened in around 1788. After its closure in 1835, it was converted into cottages. Froyle former parish workhouse, 2004. Selborne's parish workhouse on Gracious Street was the subject of an attack in November, 1830, during the "Captain Swing" riots when agricultural labourers across southern England protested against low wages, expensive food, and the growing mechanization of farms. On Monday, 22nd November, a mob assailed the Selborne workhouse, turned out the occupants, burned or smashed the fittings and furniture, and pulled off the roof. 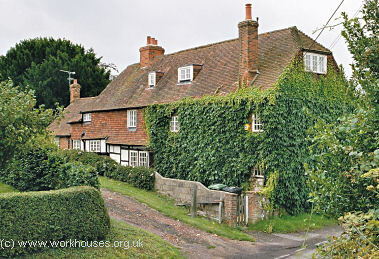 The following day, an even larger mob, including the Selborne rioters, did the same to the workhouse at nearby Headley. The ringleaders were later transported to Australia. 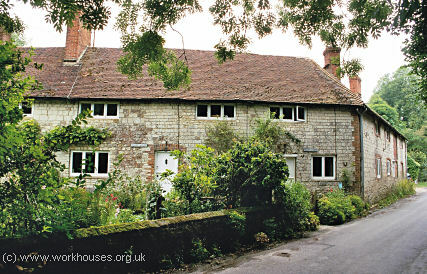 Selborne former parish workhouse, 2004. Hampshire: Alton (3), Bentley, Bentworth, Binstead, Chawton, Farindon, Froyle, Hartley-Maudit, Holybourne, Lasham, Medsted, Neatham, Newton-Valence, Selborne, Shalden, East Tisted, Wield, East Worldham, West Worldham. The population falling within the union at the 1831 census had been 10,342 with parishes ranging in size from Hartley-Maudit (population 69) to Alton itself (2,742). The average annual poor-rate expenditure for the period 1831-34 had been £12,694 or £1.4s.7d. per head of the population. The new Alton Board of Guardians took over the existing workhouse for use by the Union. Its location and layout are shown on the 1869 map below. Alton front block from the north, 2001. Alton front block from the south-east, 2001. In 1869, Alton Union was enlarged by the addition of parishes from the former Headley Incorporation which had been dissolved along with the other remaining Gilbert Unions. Building.— The workhouse stands on a dry and extensive site, a short distance from the town. The house is an old house remodelled, and contains ample accommodation for all the inmates. There are separate infectious wards at the back of the workhouse, which are sufficient for the purpose of the union; there are four rooms for males, and four for females. No separate sick wards are provided for children; but, as the children in this house are all under the age of nurture, the emission is not of material consequence. The ventilation and drainage are both good, and there is a plentiful supply of water. The sanitary state of the house is good. Furniture.— The beds for the aged and infirm and sick are stuffed with feathers; for the othr classes with flock and cut straw. Basins for washing are provided in the sick and infirm rooms, lavatories for the able women, pump trough and hand bowls for men. There are, as usual, baths in the receiving wards. Inmates.— The classification is carried out in accordance with the order, and there is an extra classification of the well-behaved women and those of bad character. The men are provided with a coat and waistcoat of woollen cloth, and trousers of corded fustian, and a round frock, and the usual linen and stockings ; the women with linsey gowns and the usual under garments. The able men are employed in pounding stones and gypsum ; the old men work in the garden, and the women in needlework and the usual household work. The old men walk in the garden attached to the house. Medical Attendance.— The drugs used for the patients are supplied by the medical officer of the workhouse. Nursing.— There is a aid nurse, assisted by the inmates, and the night and day nursing is satisfactorily performed. Chaplain.— There is a chaplain, who gives the usual services, and the Dissenters attend their own places of worship. School.— There is no school in this workhouse; the children are sent to the district school at Crondall. Generally.— Generally.-The only improvement required in this workhouse is the providing of a separate sick ward for children; but, as all the children in the house are under the age of nurture, it is not absolutely necessary. In 1925-7, an infirmary was erected to the north-east of the workhouse. Further hospital wards were added during World War II under the Emergency Medical Scheme. The hospital buildings and rear wings of the workhouse no longer exist. 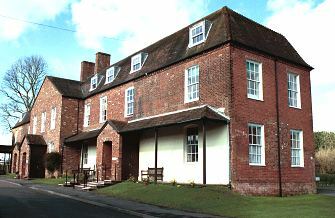 The front block of the workhouse survives as residential accommodation. Hampshire Record Office, Sussex Street, Winchester SO23 8TH. Holdings include: Guardians' minute books (1842-1930); Admissions and discharges (1888-1942 with gaps); Registers of inmates, deaths, lunatics, maternity cases etc., (1849-1942); Relieving Officer's application and report books (1879-1932); etc. John Owen Smith's Headley and Selborne Riots web pages.